Click here for my News Archive, then click on the 'more' button in the grey menu bar. As part of a major building upgrade to increase capacity at its Yagoona Centre, the RSPCA engaged Outhouse Design to design its landscape areas. 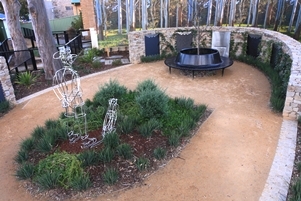 Their award winning design included a Memorial Garden which welcomes visitors to the Centre, provides a place for reflection and allows them to donate to the RSPCA by memorializing their own pets. 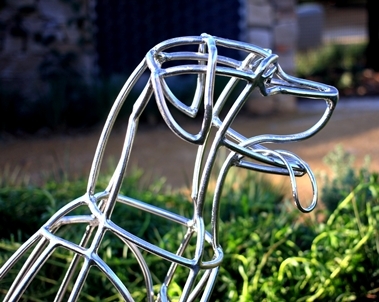 I was commissioned to create objects for the Memorial Garden that would be attractive, durable and functional. These objects are a Working Animal Memorial sculpture, Memorial Plaque Panels, water feature panels and signage. All these items were executed in marine grade stainless steel or Corten steel for durability. 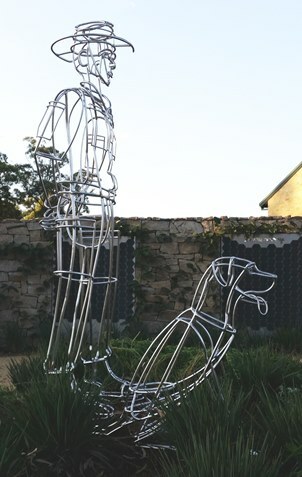 The Working Animal Memorial sculpture is of a Labrador dog and its handler which was inspired by the story of Sarbi. I have ‘sketched’ both dog and man using heat to allow me to bend the thicker sections of stainless round bar. Where finer details are usually sought by viewers, such as in the face, I have used thinner section bar and carved shape into the thicker sections. 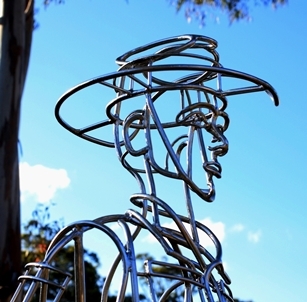 The finished pieces were then electropolished to further resist corrosion, the result being the bright finish seen on the installed sculptures. The Memorial Plaque Panels invite pet owners to memorialize their pets with an inscription on a stainless plaque. This provides a welcome income source for the RSPCA from the Garden. 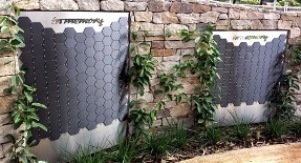 I’ve designed the plaques using the bee cell hexagon for visual interest. The charcoal grey surface on the plaques can be engraved to reveal the bright stainless below. A special nylon washer separates each plaque from its supporting panel in order to reduce the risk of crevice corrosion between the two facing surfaces. The bright annealed ‘in memory’ script is the same font I’ve used for the welcome sign at the front wall of the garden. 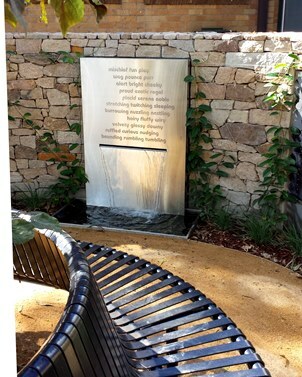 The client provided text for the pair of water feature panels which I designed to unify the builder supplied water rills and their baths. Images of my work were taken by me and Peter Brennan. If you would like to discuss design and production of 3D items for your landscape, contact me.